I have decided to write a post on products that I (or we, my husband and I) have finished. This will includes both makeups and skin care products, occasionally body and hair products too I suppose. The first products we have finished months ago was Bio Essence trial pack and also, Laneige trial pack. 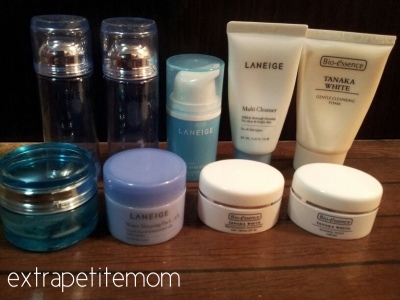 We have repurchased few products from Bio Essence and Laneige. I will write a post on our skincare routine soon, I hope! And recently I have also finished a couple of products. I'm so excited!! I love reading posts and watching videos on empty products. 1. 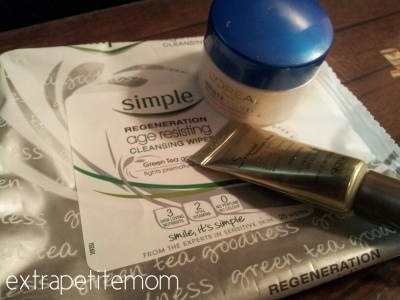 Simple Regeneration Age Resisting cleansing wipes - I used this to remove my makeup after work. It cleans most of it, especially my eyeliner which can be stubborn at times. I'm currently using the green packet from Simple as well, it works the same so I'm not going to repurchase this. This is slightly expensive than the green packet one. 2. Skin79 VIP Gold BB cream - I used this almost every morning since I started working. I had it for couple of months already. I like this because of its lower SPF than my other BB creams plus, its moisturising too since my office is air-conditioned. Definitely need something moisturising to avoid drying skin due to the coldness. I have repurchased a new one, the 15g yesterday. 3. L'Oreal White Perfect day cream - This day cream is mostly used by Dear Husband every morning. It has a smell to it that I don't like, like an old cream, I don't know how to describe it. I am not going to repurchase. I hope I will write more empty products post in the future. It might takes few more months for me to finish my skincare products and maybe year(s) to finish my makeups. I enjoy writing this kind of post, it gives me reason whether to repurchase or not the products I have been using. Afterall, there are a lot if oroducts available but not all will suit your skin type or preference.